An understanding of the decision-making process provides the pilot with a foundation for developing ADM and SRM skills. While some situations, such as engine failure, require an immediate pilot response using established procedures, there is usually time during a flight to analyze any changes that occur, gather information, and assess risks before reaching a decision. The steps leading to this decision constitute a decisionmaking process. Three models of a structured framework for problem-solving and decision-making are the 5P, the 3P using PAVE, CARE and TEAM, and the DECIDE models. They provide assistance in organizing the decision process. All these models have been identified as helpful to the single pilot in organizing critical decisions. Single-Pilot Resource Management (SRM) is about how to gather information, analyze it, and make decisions. Learning how to identify problems, analyze the information, and make informed and timely decisions is not as straightforward as the training involved in learning specific maneuvers. Learning how to judge a situation and “how to think” in the endless variety of situations encountered while flying out in the “real world” is more difficult. There is no one right answer in ADM, rather each pilot is expected to analyze each situation in light of experience level, personal minimums, and current physical and mental readiness level, and make his or her own decision. SRM sounds good on paper, but it requires a way for pilots to understand and use it in their daily flights. One practical application is called the “Five Ps (5 Ps).” [Figure 2-9] The 5 Ps consist of “the Plan, the Plane, the Pilot, the Passengers, and the Programming.” Each of these areas consists of a set of challenges and opportunities that every pilot encounters. Each challenge and opportunity can substantially increase or decrease the risk of successfully completing the flight based on the pilot’s ability to make informed and timely decisions. The 5 Ps are used to evaluate the pilot’s current situation at key decision points during the flight or when an emergency arises. These decision points include preflight, pretakeoff, hourly or at the midpoint of the flight, pre-descent, and just prior to the final approach fix or for VFR operations, just prior to entering the traffic pattern. Figure 2-9. The Five Ps checklist. The 5 Ps are based on the idea that pilots have essentially five variables that impact his or her environment and forcing him or her to make a single critical decision, or several less critical decisions, that when added together can create a critical outcome. These variables are the Plan, the Plane, the Pilot, the Passengers, and the Programming. This concept stems from the belief that current decision-making models tended to be reactionary in nature. A change has to occur and be detected to drive a risk management decision by the pilot. For instance, many pilots complete risk management sheets prior to takeoff. These form a catalog of risks that may be encountered that day. Each of these risks is assigned a numerical value. If the total of these numerical values exceeds a predetermined level, the flight is altered or cancelled. Informal research shows that while these are useful documents for teaching risk factors, they are almost never used outside of formal training programs. The 5P concept is an attempt to take the information contained in those sheets and in the other available models and use it. The second easiest point in the flight to make a critical safety decision is just prior to takeoff. Few pilots have ever had to make an “emergency takeoff.” While the point of the 5P check is to help the pilot fly, the correct application of the 5 P before takeoff is to assist in making a reasoned go/no-go decision based on all the information available. That decision will usually be to “go,” with certain restrictions and changes, but may also be a “no-go.” The key idea is that these two points in the process of flying are critical go/no-go points on each and every flight. The third place to review the 5 Ps is at the midpoint of the flight. Often, pilots may wait until the Automated Terminal information Service (ATIS) is in range to check weather, yet, at this point in the flight, many good options have already passed behind the aircraft and pilot. Additionally, fatigue and low-altitude hypoxia serve to rob the pilot of much of his or her energy by the end of a long and tiring flight day. This leads to a transition from a decision-making mode to an acceptance mode on the part of the pilot. If the flight is longer than 2 hours, the 5 P check should be conducted hourly. The last two decision points are just prior to descent into the terminal area and just prior to the final approach fix, or if VFR, just prior to entering the traffic pattern as preparations for landing commence. Most pilots execute approaches with the expectation that they will land out of the approach every time. A healthier approach requires the pilot to assume that changing conditions (the 5 Ps again) will cause the pilot to divert or execute the missed approach on every approach. This keeps the pilot alert to all manner of conditions that may increase risk and threaten the safe conduct of the flight. Diverting from cruise altitude saves fuel, allows unhurried use of the autopilot and is less reactive in nature. Diverting from the final approach fix, while more difficult, still allows the pilot to plan and coordinate better, rather than executing a futile missed approach. Let’s look at a detailed discussion of each of the Five Ps. The “Plan” can also be called the mission or the task. It contains the basic elements of cross-country planning, weather, route, fuel, publications currency, etc. The “Plan” should be reviewed and updated several times during the course of the flight. A delayed takeoff due to maintenance, fast moving weather, and a short notice TFR may all radically alter the plan. The “plan” is not only about the flight plan, but also all the events that surround the flight and allow the pilot to accomplish the mission. The plan is always being updated and modified and is especially responsive to changes in the other four remaining Ps. If for no other reason, the 5 P check reminds the pilot that the day’s flight plan is real life and subject to change at any time. Obviously, weather is a huge part of any plan. The addition of datalink weather information gives the advanced avionics pilot a real advantage in inclement weather, but only if the pilot is trained to retrieve and evaluate the weather in real time without sacrificing situational awareness. And of course, weather information should drive a decision, even if that decision is to continue on the current plan. Pilots of aircraft without datalink weather should get updated weather in flight through an FSS and/or Flight Watch. Both the “plan” and the “plane” are fairly familiar to most pilots. The “plane” consists of the usual array of mechanical and cosmetic issues that every aircraft pilot, owner, or operator can identify. With the advent of advanced avionics, the “plane” has expanded to include database currency, automation status, and emergency backup systems that were unknown a few years ago. Much has been written about single pilot IFR flight, both with and without an autopilot. While this is a personal decision, it is just that—a decision. Low IFR in a non-autopilot equipped aircraft may depend on several of the other Ps to be discussed. Pilot proficiency, currency, and fatigue are among them. Flying, especially when business transportation is involved, can expose a pilot to risks such as high altitudes, long trips requiring significant endurance, and challenging weather. Advanced avionics, when installed, can expose a pilot to high stresses because of the inherent additional capabilities which are available. When dealing with pilot risk, it is always best to consult the “IMSAFE” checklist. The combination of late nights, pilot fatigue, and the effects of sustained flight above 5,000 feet may cause pilots to become less discerning, less critical of information, less decisive, and more compliant and accepting. Just as the most critical portion of the flight approaches (for instance a night instrument approach, in the weather, after a 4-hour flight), the pilot’s guard is down the most. The 5 P process helps a pilot recognize the physiological challenges that they may face towards the end of the flight prior to takeoff and allows them to update personal conditions as the flight progresses. Once risks are identified, the pilot is in a better place to make alternate plans that lessen the effect of these factors and provide a safer solution. 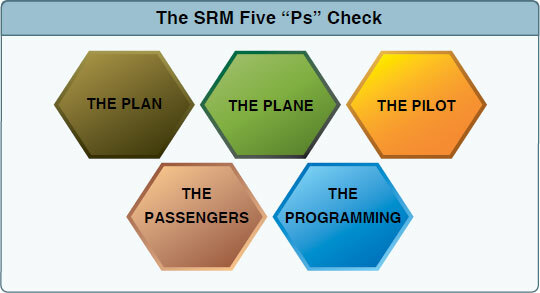 One of the key differences between CRM and SRM is the way passengers interact with the pilot. The pilot of a highly capable single-engine aircraft maintains a much more personal relationship with the passengers as he/she is positioned within an arm’s reach of them throughout the flight. The necessity of the passengers to make airline connections or important business meetings in a timely manner enters into this pilot’s decision-making loop. Consider a flight to Dulles Airport in which and the passengers, both close friends and business partners, need to get to Washington, D.C. for an important meeting. The weather is VFR all the way to southern Virginia, then turns to low IFR as the pilot approaches Dulles. A pilot employing the 5 P approach might consider reserving a rental car at an airport in northern North Carolina or southern Virginia to coincide with a refueling stop. Thus, the passengers have a way to get to Washington, and the pilot has an out to avoid being pressured into continuing the flight if the conditions do not improve. Pilots also need to understand that non-pilots may not understand the level of risk involved in flight. There is an element of risk in every flight. That is why SRM calls it risk management, not risk elimination. While a pilot may feel comfortable with the risk present in a night IFR flight, the passengers may not. A pilot employing SRM should ensure the passengers are involved in the decision-making and given tasks and duties to keep them busy and involved. If, upon a factual description of the risks present, the passengers decide to buy an airline ticket or rent a car, then a good decision has generally been made. This discussion also allows the pilot to move past what he or she thinks the passengers want to do and find out what they actually want to do. This removes self-induced pressure from the pilot. The advanced avionics aircraft adds an entirely new dimension to the way GA aircraft are flown. The electronic instrument displays, GPS, and autopilot reduce pilot workload and increase pilot situational awareness. While programming and operation of these devices are fairly simple and straightforward, unlike the analog instruments they replace, they tend to capture the pilot’s attention and hold it for long periods of time. To avoid this phenomenon, the pilot should plan in advance when and where the programming for approaches, route changes, and airport information gathering should be accomplished, as well as times it should not. Pilot familiarity with the equipment, the route, the local ATC environment, and personal capabilities vis-à-vis the automation should drive when, where, and how the automation is programmed and used. The pilot should also consider what his or her capabilities are in response to last minute changes of the approach (and the reprogramming required) and ability to make large-scale changes (a reroute for instance) while hand flying the aircraft. Since formats are not standardized, simply moving from one manufacturer’s equipment to another should give the pilot pause and require more conservative planning and decisions. The SRM process is simple. At least five times before and during the flight, the pilot should review and consider the “Plan, the Plane, the Pilot, the Passengers, and the Programming” and make the appropriate decision required by the current situation. It is often said that failure to make a decision is a decision. Under SRM and the 5 Ps, even the decision to make no changes to the current plan is made through a careful consideration of all the risk factors present.